Its funny how restaurants get a branding from the public and it is that brand that defines you, it tells the world who you are and sometimes that public branding is often very difficult to understand, especially if you haven’t hired a branding company that focuses and streamlines that brand for you. TJ’s Sweetie Pies Noho is a soul food restaurant that was introduced to many of us via their reality show on the OWN Network. By looking at the television people assumed that the soul food was out of this world, they assumed and understood that all the drama and disorganization we saw on tv was one of the ingredients that made the food so delectable, and we also thought the people waiting in lines to get in was all the branding we needed to convey to us that the food was absolutely delicious, and if that wasn’t enough we had an pseudo endorsement from Oprah and to be honest is all the endorsement the world at large needs. Walking towards the Sweetie Pie’s in North Hollywood, California, I wasn’t sure if I was in the correct vicinity or not, but the line of people waiting outside and the smell of fried chicken let me know that I had come upon the correct spot. Now lines of people outside automatically gives the impression that mouth-watering scrumptiousness awaits and immediately you become anxious for your tastebuds to be tantalized, however not necessarily so. Now as I write this, I can see how that setup is genius, the perception of a thing often draws people to a thing. But the reality is, what you are actually being drawn to is an order line. 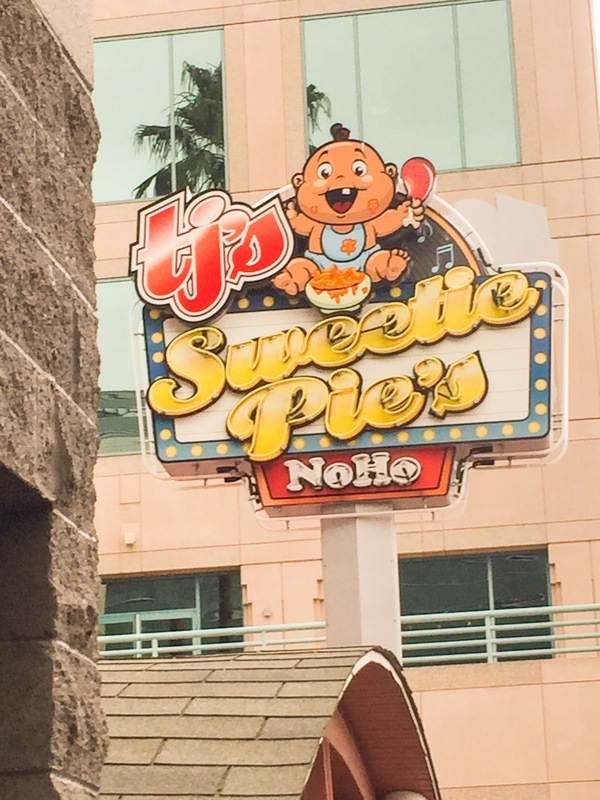 The order line at Sweetie Pie’s Noho is taken from a window, while you stand outside. Once you place that order you then have the option of sitting inside or outside, and in both cases the seating is extremely limited and very quaint, so me and my crew opted for take out. 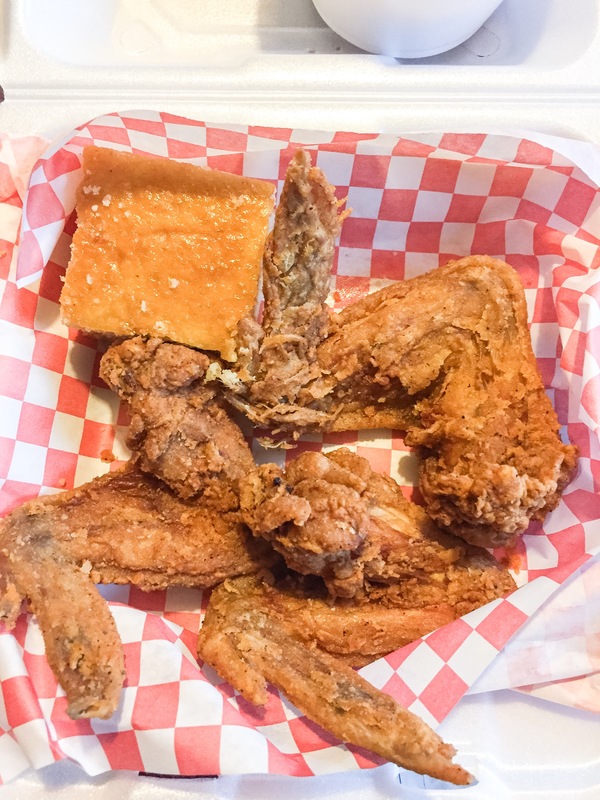 First up, 3 jumbo size fried chicken wings with a side of corn bread. On first sight the chicken was definitely pretty as much a fried wing could be, I mean it was golden brown, it looked fresh and freshly cooked, it was crispy and meaty, but delicious I can’t write. It was good no doubt but what exactly is good, except for the enemy of best. Next up was the corn bread, or should I write shame bread, because it was a shame to offer this on the menu and to include it anyone’s meal. It was cold, it was dry, it lacked flavor, it lacked butter, it was to gritty, it should be removed from the menu. Second up, the macaroni and cheese. Now every soul food restaurant goer knows that it is that the macaroni and cheese that is your redemption meal. It is is the side dish that can make you forget the transgressions of the not so good item you just ate. 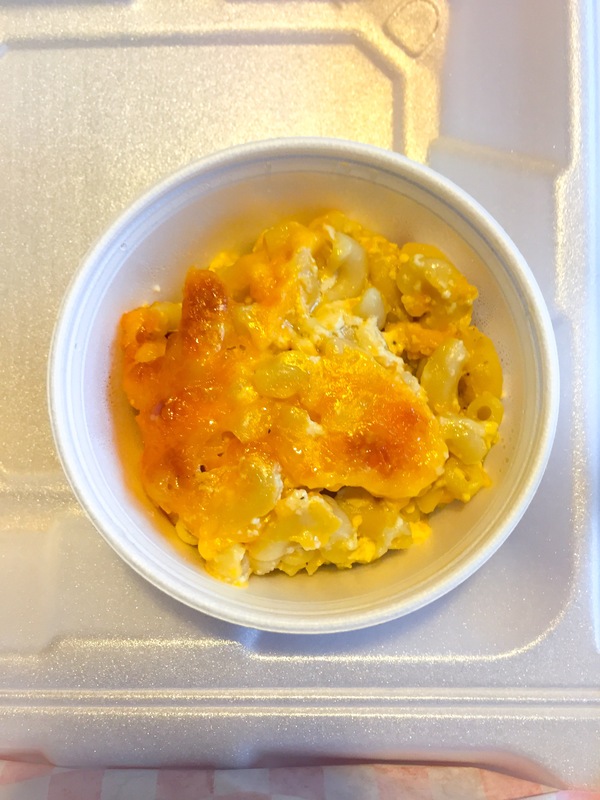 But this macaroni and cheese caused Sweet Pie’s transgressions with the corn bread not to be forgiven, but made their sins more prominent. Sweetie Pie where was the cheese, where was the moistness, where was the flavor, where was your foot that we assumed would be in it? Third up, potato salad, or should I write mashed salad. 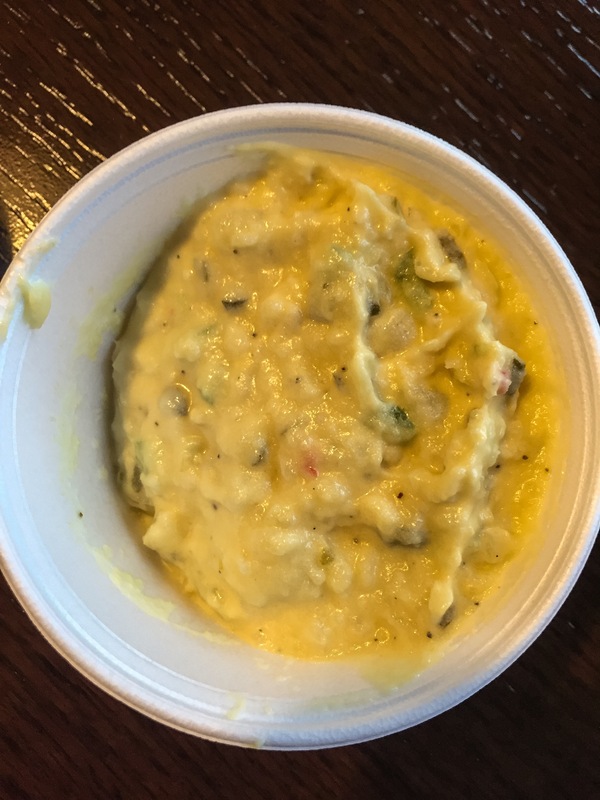 Isn’t potato salad supposed to have texture, isn’t it supposed to have lots of clearly defined potatoes showing, is it not supposed to look like I intend to spread on a cracker. Despite all of that it wasn’t bad, it wasn’t my momma’s, but it wasn’t bad. It was smidge sweet, a smidgen tangy, and quite flavorful. 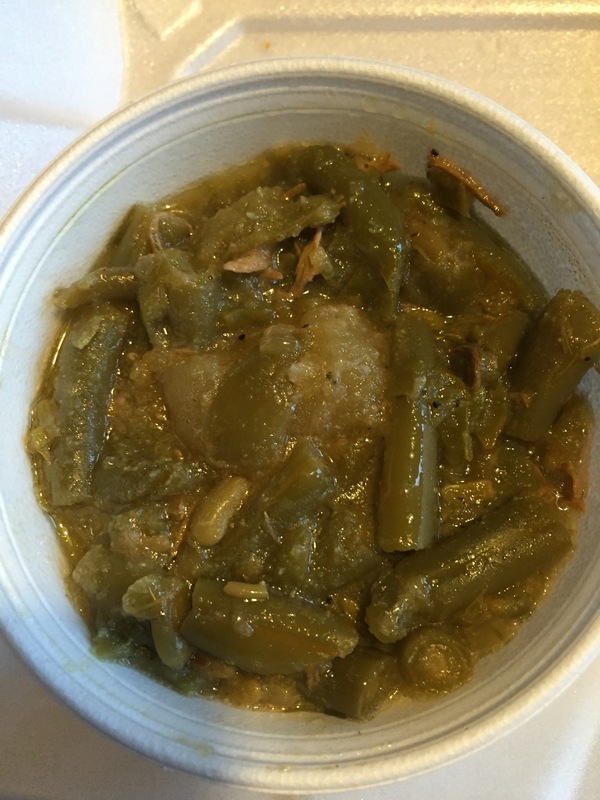 Fourth up, the string beans, which were actually delightful, that had chunks of potato which probably should have been in the potato salad, but it was uniquely seasoned and it resonated with my tastebuds quite nicely. Last up, peach cobbler. 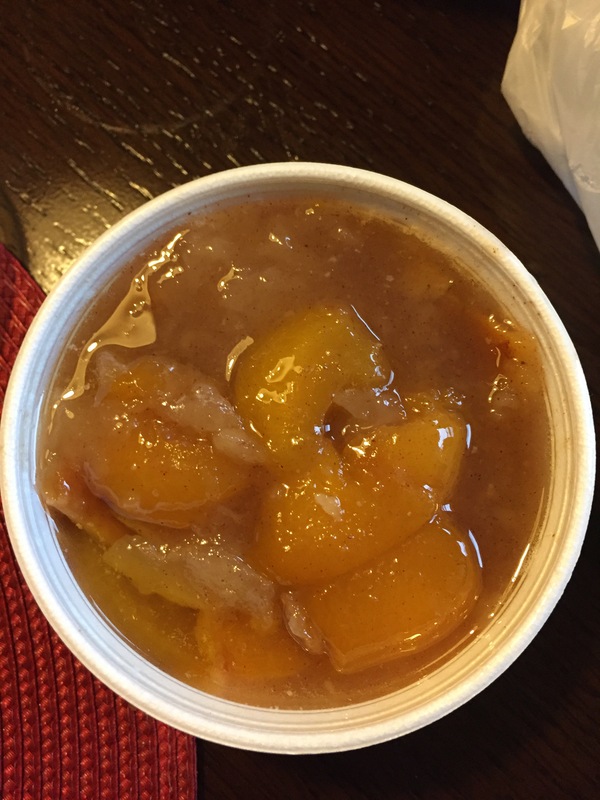 Sweet peaches, sturdy crust, just the right amount of sweetness from the liquid, and rounded out the meal with me feeling that my meal in totality was tolerable. What that basically means is that I definitely would not wait in line for 20 minutes for Sweetie Pies, I would never eat the mac and cheese if someone gave it to me without me paying, I wouldn’t ever give my corn bread to a homeless fellow, I would save him the disappointment, but I would eat the fried chicken again, if I was hungry, someone bought it for me, and I was clear that it was not my last meal in life. Sweetie Pie I had such high hopes for you, watching Ms. Robbie caused me to glean enthusiasm, the lines outside fueled my enthusiasm, but in the end my fire didn’t stay lit, my enthusiasm dwindled, and hopes shattered. I want to remain hopeful for Sweetie Pies. I’ve been there too and don’t disagree totally. I’m hoping that they listen and eventually “be all they can be.” Expansion is not easy, takes time. I’m still rooting for you miss Robie. This is very disappointing, the food looks horrible and I probably would not have eaten it; however I do believe in second chances. As previously mentioned, expansions are not easy. Perhaps they will get the message about this subpar food, and make the necessary adjustments asap.